Home of PottieStickers & RewardEmStickers portable toilet training and behavioral modification systems for todays "family on the go lifestyle... because consistancy counts"
Un percentaje de cada venta va a la investigacion de cancer en memoria carinosa de nuestro padre. All safety requirements exceeded manufacturing standards for our products to keep your child safe! PottieStickers also used as RewardEmStickers, are all lead free safe products for your children. Conforms to ASTM F963 Requirements, Mechanical Hazards, Labeling, Soluable Havey Metals Content. Conforms to 16 CFR - 1303 Lead Content, 1500.44 Flamibility. PottieStickers ~ Have your child independent in the bath room in a matter of days. 12 different PottieStickers designs guarantee sussess. Welcome to PottieStickers can be used as RewardEmStickers web site. 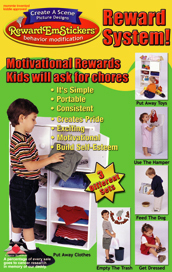 We teach our children to feed themselves, how to speak and dress themselves and when we need them to potty train or learn to do chores sometimes we all need a little extra help motivating our children. Learning something new can be fun and exciting.When it is time to teach our children to go potty, saving a hundred dollars a month on diapers, wipes and creams is a big reward for parents. Having well behaved children and able to go to a nice restaurant and visiting friends is a pleasure to take little angels. We all want to praise our children. PottieStickers also used as RewardEmStickers are colorful incentive award kits that allow kids to make fun pictures while learning to potty train. PottieStickers & RewardEmStickers are portable toilet training and behavioral modification systems to travel with your child for today’s family-on-the-go-lifestyle... because consistency counts. PottieStickers has won over 12 awards being named Best New Product of the Year by judge Donald Trump at the American Business Awards, Best Children's Product by Orca, The National Parenting Center's Seal of Approval and the iParenting Hot Media Award to name a few. PottieStickers Toilet Train Your Child in 7 Days proven secret laws of toilet training come on a free cd inside each package. Children are potty trained with PottieStickers using an average of one group of packages. Our "Get the poop on potty training" provides loads of toilet training tips and facts to make moms life easier and hassel free in toddler toilet training. When you place an order on our secure web site we accept all major credit cards, checks or money orders. Orders generally ship within two working days. Make sure you check out our other “Made for Mom” mom invented products. Made for Mom …by Moms is an exclusive group of mom inventors with solutions to daily challenges that are affordable and enhance our children’s lives. These are great products you can't find in most stores. One FREE set of PottieStickers with every order placed until December 25th.